Bath’s Kennedi Sullivan scoops up a throw at first base during Thursday’s game against Napoleon at Bath High School. See more game photos at LimaScores.com. Bath’s Tara Cooper makes contact while at bat during Thursday’s game against Napoleon at Bath High School. 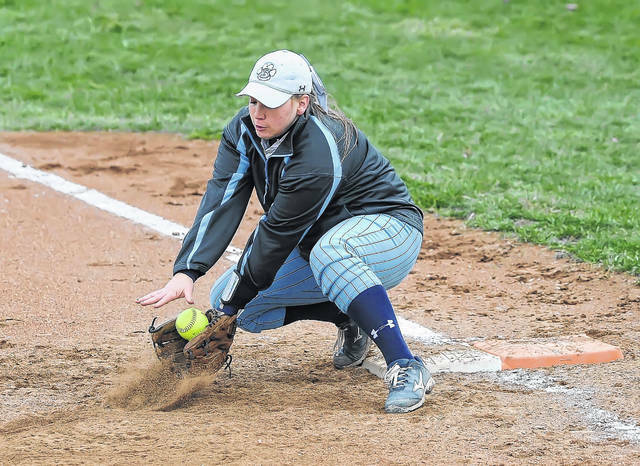 BATH TOWNSHIP — Bath and Napoleon endured many missed opportunities in Thursday’s non-league softball matchup. There were 19 baserunners stranded between the two squads. However, Napoleon only needed one opportunity to cash in. With the game knotted 2-2 at the end of seven innings (regulation game), Napoleon managed to get two timely hits in the eighth inning to pull away for a 5-2 victory. With the extra-inning win, Napoleon improves to 2-1. Bath slips to 1-3. Bath pitcher Morgan Mosely worked all eight innings. Mosely scattered 10 hits, while striking out three and walking four. Mosely tossed 114 pitches on the day. Allison Mack went the distance for Napoleon in the circle. Mack scattered 10 hits on the day, while fanning six, walking two and hitting a batter. Mack threw 112 pitches. Both teams found ways to get out of jams throughout seven innings. However, Napoleon finally broke through in the eighth inning. In the top of the eighth, Mosely walked two batters. Then, a bloop single by Megan Richardson (3 for 5), followed with a triple by Stevie Rieger, drove in the three runs for Napoleon. Bath did rally in the home half of the eighth, but came up short, leaving two baserunners stranded. 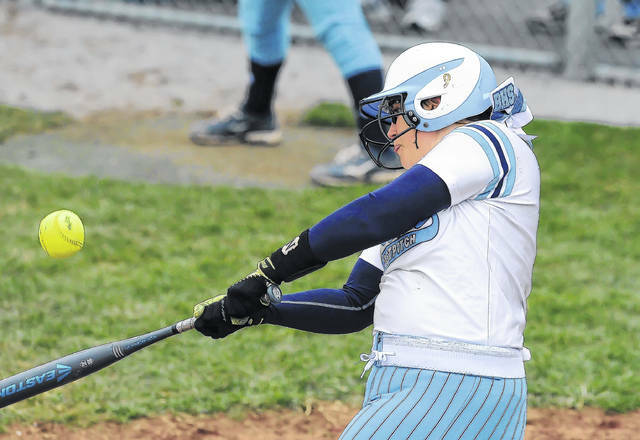 “Their pitcher did a nice job of keeping us off-balance,” Bath coach Hannah Slavin said. I think the big downfall for us was not getting some bunts down in key situations and advancing some runners, and ultimately scoring runs. Bath enjoyed a short-lived 2-1 lead after one inning. In the bottom of the first, Bath scored the two runs on three hits. Kali Armstrong led off with a single. Annika Heminger came up two batters later and smacked a double to left, scoring Armstrong. Tara Cooper followed Heminger with a double into the right centerfield gap, scoring Heminger. However, Bath was held in check the rest of the game. Bath left baserunners stranded in every inning except for the fifth, when Mack retired Bath in order. Armstrong led Bath at the plate, going 3 for 5. Cooper and Tori Dackin each had two hits for Bath.